When it comes to getting a complete and thorough muscle and stamina building workout from the comfort of your home, home gyms rise above all the other types of fitness equipment. Commercial versions are found in club gyms everywhere because they’re designed to offer wide ranging exercises for a total body workout, so home gyms are naturally popular at home but in a more compact and affordable version. However, there is a setup for the home that has similarities and is more to the liking of very experienced fitness enthusiasts and pro athletes, and that is a functional trainer or cable crossover machine. While a regular home gym offers exercises where parts of your body move in a single plane of motion, a home gym functional trainer gives you more freedom to work them in arcs and in a wider range of motion. The best home functional trainer machine makes you work your stabilizing muscles in addition to the main muscles so that your form and balance is taken care of as well. If you’re not use to using functional trainers or free weights, it is recommended that you get a compact home gym instead. All available exercises limit you to repetitious fixed plane motions that are safer to do as they’re biomechanically correct. They are also better if you are more interested in adding heavier weights and isolate certain groups of muscles for body building. With these you can do bench presses, military presses and limb extensions. However, if you’re comfortable using free weights, know how to exercise with them safely, and want to concentrate more on your core and stabilizing muscles, then a functional trainer home gym is better. Of course, if you’re more comfortable just lifting barbells and need a safe way to do it at home, get a power rack instead. We will soon get to our functional trainer reviews, but before that let’s explain what exactly functional training is and how to choose the best one for your needs. 1 What is Functional Training with a Cross Over Cable Machine? What is Functional Training with a Cross Over Cable Machine? 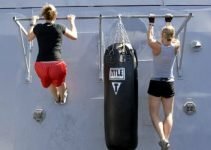 Functional training involves the conditioning of the body and various muscles to be able to use them for optimal sports performance through correct technique and form. When doing functional training solely for muscle toning and body building, this usually means that you’re exercising your core muscles as well. When using a cable cross over machine or functional trainer, you will typically use slightly lighter weight stacks than the ones that come with a home gym, but you can still do regular body building exercises. Where they differ from regular home gyms is that they have different handles that are attached to free movement cables. This allows you to move your arms in any direction and even in an arc. Pro golfers, baseball and tennis players use these cable crossover machines to perfect their stroke techniques. Even soccer players can use the weighted cables for their legs to perfect kicks. Inexperienced users should be warned that it is easy to injure yourselves because the free range of movement with weights can strain the very muscles you want to strengthen if you don’t follow a technically correct line of movement. 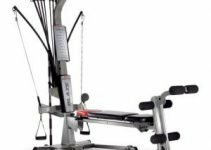 At the end of this article, we’ll tell you how to choose a good functional trainer for your home, but if you’re already well versed in the functioning and features of these machines and just want a little help in rounding up the best fitness functional trainers for the home, read on. Currently available for an entry-level price, the PowerLine PCCO90X Cable Crossover is designed for a variety of lower and upper body workouts. It has a 180-degree range of motion and as such, you can use this crossover machine for whole body conditioning. Another advantage of this machine is that you never have to worry about setting up or maintaining heavy plates. The level of resistance generated by the PCCO90X depends on the size of the weight plates loaded onto the convenient plate pegs on either side. The cable pulleys at the top and bottom of the upright supports allow for effective training of the upper and lower body. While the cable pulleys aren’t height adjustable, you still have a lot of freedom to create a high number of exercise variations. These include iso-lateral cable cross, straight arm lat pulldown, side lateral raises, hammer curls, overhead extensions, cable split squad, standing leg curls, rear glute extensions and cable hip extensions just to name a few. Compared to most crossover machines, the frame on this model is lighter. It comes with a professional carriage system that travels on patented nylon bushings. The crossover machine is also fitted with two cables, eight ball-bearing pulleys and an ankle strap. Additional accessories like weight plates, chin-up handles and collars are sold separately. Its frame is backed by a 10-year warranty while a 1-year warranty covers the rest of the parts. The pulley system allows for a weight ratio of 1:2 and the machine can handle more than 300 pounds of standard or Olympic weights on each side. Like any other machinery, the PowerLine PCCO90X comes with a few downsides. For starters, the range of attachments provided is limited. In addition, the instruction manual isn’t very easy to comprehend. Some customers also complained that the lack of cross-brace only allowed for slight movement of the legs when pulling the lower cables together while using heavier weights. Check the price of the PowerLine PCCO90X Cable Crossover. From cable machines and bars to kettle bells and home gyms, Valor Fitness manufactures all kinds of fitness equipment. The BD-61 Cable Crossover Station is one of the brand’s best. It does not come with weights, but it does come with clips for standard as well as olympic weights of your own. You can add at least up to 300 lbs to it. The station is constructed from heavy-duty steel, a material preferred for its longevity and durability. It is a dual pole, upper and lower dual cable system that offers 1:1 resistance. It features dual pulley systems on the top and bottom that allow for 17 different adjustments and the ability to use a variety of training planes and plenty of exercises. The double bar track is a welcome feature that not only provides ample resistance required for isolateral exercises, but also adds to the stability. You can do single arm exercises if you want, but you still have to the load the weights equally on the weight pulley system to keep it balanced. Combine the above with plate storage as well as a multi-grip pull-up station, and what you get is a surprisingly compact unit that doesn’t require much space. Setting it up is easy and takes less than an hour. Valor Fitness offers handy accessories with the BD-61 like 2 single hand strap handles, 1 row bar and 1 lat bar for an optimized experience. Some of the concerns cited by customers include cheap material used for the pulleys. There are also some irregularities on the fly posts. Otherwise, you get great value for your money when you purchase the Valor Fitness BD-61 Station. Check the price of the Valor Fitness BD-61 Cable Crossover Station. Another great product from Valor Fitness is the BD-62, which is similar to the BD-61 in some ways. However, if the BD-61 is not compact enough for you, then this model is a one-column functional trainer with the same 1:1 resistance ratio. The other main difference between the BD-61 and the BD-62 is that the latter is usually mounted onto a wall to make it more stable. Whichever way you set it up, it is the most compact functional trainer you can buy. Similarities between the two include heavy-duty steel construction, dual cable pulley systems on the top and bottom, and 17 position adjustments on either side with dual cable hand grips as well. The pulleys are adjustable in height. It has a double bar track that provides increased stability and resistance. If you want to use a single cable at a time to do one-sided lateral pulls or even any high resistance exercises, it’s best that you install it on a wall to prevent it from toppling, as the small footprint does mean lower stability. However, this design gives you more versatility at home with just one machine than you would get with most others. Also notable is that the BD-62 holds standard and Olympic-style weight plates. While it is well designed, it does not come with any bottom support bracket whatsoever, so certain exercises won’t feel secure. However, you can buy some inexpensive accessories online or from your local hardware store that will do the trick and give you peace of mind. The BD-62 offers great value for money and allows you to get a total body workout in the comfort of your home. Check the price of the Valor Fitness BD-62 Wall Mount Cable Station. Now we come to functional training machines that come with their own weight stacks. Body-Solid offers a variety of weight machines ranging from home gym systems to functional trainers. One of their best sellers is the Body-Solid GDCC200, which offers a variety of exercise options. It features a sturdy, stable frame that is constructed using 11-gauge steel tubing. The tubes of the main frame are coated with gray paint for added scratch and corrosion resistance. Also featured are rubberized stabilizers that enhance stability and protect your floors. All of the pulleys are made from heavy-duty nylon and reinforced with fiberglass. and are completely adjustable. The integrated industrial-grade ball bearings go a long way towards providing added durability. Many customers loved that the main handles offer up to 20 height adjustments and that the machine has a 180-degree range of movement. This allows for tons of exercise variations for full body conditioning. A few of the workouts with this model include oblique twist, reverse fly, bench press, squats, lat pulldown, triceps extension, chin up, seated crunch, leg deltoid raises and more. However, while the dual position pull up bar is included, the squat bar is not. The weight resistance system is made up of two stacks of 10 lb steel alloy plates, each of which can go up to 160 lbs. This machine has a ratio of 1:2, meaning that 80lbs is the maximum effective load per stack. This doesn’t mean that you can’t upgrade the weight stacks, as you have the freedom of adding up to five plates on each stack, thus increasing the total weight per side to 210 lbs. While it isn’t the largest cable exercise machine on the market, the GDCC200 measures 72.5” by 42.3” and takes up a bit of storage space. It requires about 30” of clearance on all sides and can support users of up to 400lbs. Assembling the GDCC200 is a bit tough due to the fact that the parts are not labeled, but thanks to an instruction manual that provides a step-by-step guide, two people can put it together in about an hour. You will need a screwdriver and adjustable wrench to accomplish this task. Check the price of the Body-Solid Functional Cable Cross Training Center. This is the flagship functional trainer in the XMark Fitness range. It features ergonomic designed pull-up bars and dual 200 lb weight stacks made up of 10 lb plates. In terms of design, you get everything you’d expect at its price range. The cable pulleys are height adjustable, offering up to 19 different positions and a 1:2 weight resistance. This allows for versatility and a wide range of upper and lower body exercises. In addition to the cable pulleys on either side of the frame, you can perform exercises like chin-ups and pull-ups thanks to the split pull-up bars attached to the cross-beam support. Another notable feature is the cable attachment storage options. A number of storage hooks are offered by XMark as standard. This is unlike other models where the hooks are offered as an optional extra. The XM-7626 is well accessorized with 2 hand straps, 2 long strap handles, 1 short bar, 1 long bar, 1 tricep rope, 1 ankle strap and 1 leg extension leg curl strap. 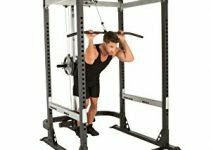 Its overall dimensions are 35.5″ L x 70.9″ W x 83.9″ H.
The handles on this cable workout machine are made from molded rubber, which ensures a comfortable and firm grip during workouts. This product is backed by an Exclusive Lifetime Warranty that provides complete coverage for as long you retain ownership. Some of the disadvantages cited by customers include a high price point. In addition, moving the pulleys up and down isn’t as smooth as one would expect. Though pricey, the XM-7626 is a great functional trainer for experienced individuals who like working out at home. Check the price of the XMark Functional Trainer Cable Machine. The Inspire Fitness FT1 is probably the smallest and most compact functional home trainer on this list that comes with weight stacks. It is the kind of functional cable machine you should have if you need something that helps you stay in shape while making a statement. The machine is well built with a heavy duty frame for durability and measures 47” D x 54” W x 81.5” H without the optional bench. The Inspire Fitness FT1 features a chrome pull-up bar system as well as an improved weight shroud protection. Dual weight stacks allow for a full body workout while the pulley system adjusts to more than 30 height settings, hence meeting all of your exercise needs. Each of the weight stacks is 150 lbs with center drilled weight plates and solid guide rods. The .5 resistance ratios ensure a smooth and continuous feel while offering a longer range of movements. However, if you’re looking for high resistance, we recommend that you purchase the optional 50 lb stacks. One of the things you will love most about the FT1 is that it is offered with an instructional flip chart with color photos of more than 40 exercises. It is also well accessorized with 1 multifunctional belt, 1 curl bar, 1 ankle cuff, 1 straight bar, 1 tricep rope, 1 swing handle, 2 5 pound add-on weights and 2 single handles. You have the option of adding a preacher curl, abdominal bar, FID bench and a 50 lbs weight stack add-on. The product is backed by a Residential Limited Lifetime Warranty as well as a 10-year Light-Commercial Warranty. Other than being expensive and heavy, there is nothing not worth loving about the FT1. It is a product that’s built to last, is easy to set up and doesn’t take up much space. Once you factor in the vast number of body conditioning exercises, you may just find that it’s worth the price. Check the price of the Inspire Fitness Functional Trainer (Ft1). BodyCraft is a well known manufacturer of fitness equipment and is the name behind some of the best ellipticals, treadmills, rowers, benches, home gyms and functional trainers on the market. The HFT functional trainer can be tucked away in the corner after use, which is a favorite feature among homeowners. It is one of the most versatile, functional and compact trainers you’ll find. The HFT comes with a choice of dual 150-pound or 200-pound weight stacks that are loaded on either side. If you decide to buy the lower weight machine first, you can always add optional 10 lb weights later on as you progress and end up with 200 lbs on each side. Because of the 2:1 resistance ratio, users will get up to 100 lbs of resistance on either side. This functional training home gym is constructed using heavy duty steel and 11-gauge steel tubing for longevity. Another notable feature is the dual cable column pulley system. Both pulleys are independent of each other and allow for up to 31 height adjustments with 180-degree rotation, thus meeting all of your exercising needs. The pulleys can extend to reach 79.5” to optimize your experience. The aircraft cable along with the nylon-coated cables and pulleys are rated at 2000 pound tensile strength. Precision, sealed ball bearings on this adjustable cable machine are a nice addition that allow for increased range of motion as well as a smooth pull. The guide rods are made from tubular steel and coated with chrome for durability. The accessories included with the HFT are 2 single handles, 1 ankle strap, 1 tricep rope, 1 assisted pull-up and push-up nylon strap, 1 short bar, 1 long bar, a workout placard with more than 70 suggested exercises, and 1 hook for each of the above. This product is backed by a Limited Warranty for commercial use, 10-year limited warranty on the frame and a 2-year limited warranty on the parts. Also included is a lifetime warranty on frame and parts if machine is for residential use. Check the price of the BodyCraft HFT Functional Trainer Home Gym. If you’re going to invest in a functional training rig, you should know what to look for before choosing the right one. Here are the various important features. You should be able to perform a maximum variety of exercises with the machine. Various adjustments to the cable positions, etc., will enable you to do them. There are a few single weight stack machines available that are very compact and inexpensive but very few of these are recommended, as you can only exercise one side of the body at a time when you do lateral pulls. You risk developing an imbalance with your muscles unless you do the exact same number and type of exercises on both sides. A double weight stack machine lets you exercise both sides of your body at the same time and you can get done with your workout faster. If you can only get a single pole system, at least make sure that it comes with two cable grips so that you can do forward pulls with both hands. Also check the maximum amount of weight you can add to each stack. The higher it is, the greater amount of progression you can get as you get stronger and better at it. You can also get cable crossover machines with or without included weight stacks. The ones without are obviously cheaper but you have to already have enough weights or buy them separately. These machines will come with a maximum allowable weight rating. Also check the weight ratio of the machine, i.e. how much weight do you have to add to get a certain amount of user weight resistance? Ideally, it should be 1:1, but a majority of trainers are rated at 2:1 or even 3:1. This means that for 2:1, in order to get 50 lbs of resistance per side, you have to have a weight stack of at least 100 lbs per side. You can imagine how bulky a 3:1 machine would be! Because cable machines for home use are usually more compact than commercial gym ones, certain exercises like power lunges and weighted sprints require you to move out of the space taken up by the trainer. The longer the cables, the better the range of exercises and freedom of movement. No matter the level of resistance, all your movements should be smooth, right from the beginning to the end of each stroke/pull. Jerky movement means that the cables tend to get stuck in the pulley system. The best cable crossover machine is the one that you will use regularly. That means it needs to be easy to adjust, right from the cable positioning to changing the weights. This will also reduce the time needed between exercises to adjust for a new exercise. If the parts are not easy to adjust, you’ll keep losing your rhythm and wasting time. Make sure that the trainer you’re eyeing has enough included accessories and attachments. You’ll often find that some cheaper trainers don’t come with any accessories and if you buy just a few of them separately, the total cost will end up being more than a more expensive trainer that has many accessories included in the package. Even weight plates can add up unless you’re happy to stick to buying low weights for the long term. Basic cable crossover machine attachments include at least one length of hand cables and at least one ankle strap, but the better ones also come with at least a chin up bar, while the higher end ones can include several different types of cables and bars.